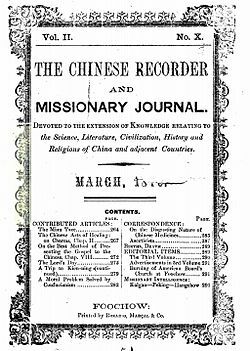 The Methodist Press in Foochow first published a journal called The Missionary Recorder: A Repository of Intelligence from Eastern Missions, and Medium of General Information in 1867, shortly after it became legal for foreigners to live in China and for missionaries to proselytize there. This journal was short-lived, however, lasting only a year. The Methodist Press followed it with Chinese Recorder and Missionary Journal in 1868. Justus Doolittle, a missionary of the American Board of Commissioners for Foreign Missions joined the Rev. S.L. Baldwin of the American Methodist Episcopal Mission in the editorship, but this journal stopped publication in May 1872 after the publication of Volume 4. The Presbyterian Press in Shanghai took up bi-monthly publication in January 1874, initiating a sixty-seven year run, becoming monthly in 1886. Rev. L.N. Wheeler served from 1892 to 1908. Rev. G.F. Fitch became editor in 1908 and was joined in April 1911 by the Rev. Nelson Bitton in April 1911 (who served only briefly). In January 1912, the Rev. Frank J. Rawlinson became first associate editor, then in 1913 editor. In the late 1910s, Rawlinson became so involved with theologically liberal causes and support of Chinese nationalism that he was forced to resign from his mission; instead he joined the more liberal American Board of Commissioners for Foreign Missions. During the 1920s, The Chinese Recorder welcomed a wide range of views but was particularly known for its commentaries and translations of Chinese writings. Rawlinson continued until September 1937, when he was killed by a bomb dropped accidentally by a Chinese plane during the Japanese attack on Shanghai. By 1939, the journal became known as The Chinese Recorder and Educational Review, but ceased publication in December 1941. A complete run is for sale by National Taiwan University Press, including the Index by Kathleen Lodwick. A subscription-based version is also made available through the HathiTrust. As many of the volumes are now out of copyright, a listing of the volumes 1-45 (1868-1914) have been digitized and made available online through Internet Archive and the Berlin State Library. ^ a b c Lodwick, Kathleen L. (1986). The Chinese Recorder Index: A Guide to Christian Missions in Asia, 1867-1941. 1. Wilmington, DE: Scholarly Resources. pp. xi–xxiv. ISBN 9780842022507. ^ Xi, Lian (2013). The Conversion of Missionaries: Liberalism in American Protestant Missions in China, 1907-1932. University Park, PA: Pennsylvania State University Press. pp. 59–93. ISBN 9780271064383. ^ Rawlinson, John Lang (1990). Rawlinson, the Recorder, and China's revolution: a topical biography of Frank Joseph Rawlinson, 1871-1937. Notre Dame: Cross Cultural Publications. ISBN 0940121123. ^ "Information Discovery in the Chinese Recorder Index". Digital Humanities 2012. Retrieved 4 October 2016. ^ "The Chinese Recorder". HathiTrust Digital Library. 1868–1938. Retrieved 4 October 2016. ^ "The Chinese Recorder (1868-1914)". Bibliotheca Sinica 2.0. 28 December 2011. Retrieved 4 October 2016. This page was last edited on 20 January 2019, at 20:48 (UTC).